Some of the questions people always ask us are: Do hens need a rooster to lay eggs? How can you tell if an egg is fertile? Do fertilized eggs taste different? Is there a baby chicken in there? How do they lay jumbo eggs and different colored eggs? Do brown eggs taste different from white eggs? Wow, that’s a lot of questions. Let’s see if we can answer some of them today. Does a hen need a rooster to lay an egg? No, she does not. If you would like to raise chickens for eggs you absolutely do not need a rooster. They are good protection for the flock however, and necessary only if you want to hatch baby chicks. How can you tell if an egg is fertile? From the outside you can’t. If you don’t have a rooster then you will never have fertilized eggs. One of our groups of hens, about 25 or so, has one rooster. We find a few fertilized and a few not when we collect their eggs. When you crack open the egg a fertilized egg will have a bullseye as you can see in the picture below. If the egg is fertilized does that mean there is a baby chick in there? No, it does not. It means the egg could develop into a chick under the right conditions. If the egg is incubated at 85 degrees or the broody hen sits on it an embryo will begin to develop. Once incubation has begun you can candle the egg and check for development. This process takes a while, 18-24 hours. You are not going to have development if you gather your eggs daily and don’t let your broodies (want to be mommies) sit on them. 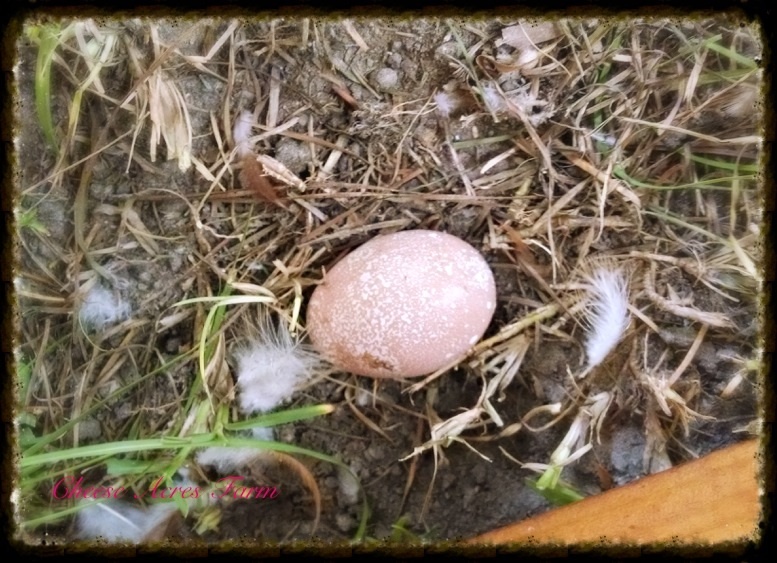 If you are unsure how long an egg has been out, such as if you find a few in an odd place instead of the nesting box you can candle the egg and see if anything is going on in there. I like to err on the side of safety and gather often. My dogs get to eat eggs that still look okay if I have doubts about eating them. Do eggs of different colors taste different? Does a fertilized eggs taste different from a non fertilized egg? No. There is no difference in taste at all. Chickens lay eggs of various colors according to breed. Color can vary slightly among the same breed. As far as its nutritional value, there is no difference there either. 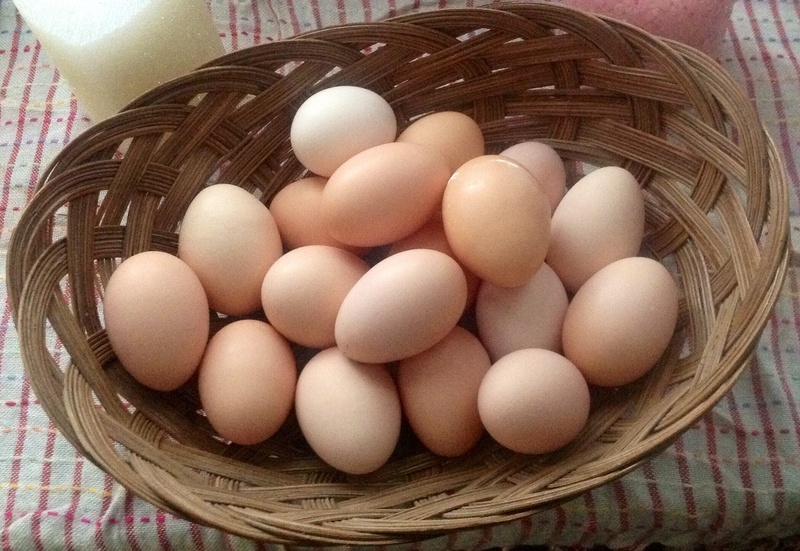 If you want to get the most nutritious egg get the freshest eggs available. The older the eggs are the more protein content is lost. Farm fresh is always best. How do you get them to lay jumbo eggs? I don’t. Just like different breeds lay different colors they also lay different sizes. Our Ameracaunas lay a small to medium blue egg. Our production reds and Rhode Island Reds lay a large and sometimes XL or jumbo brown egg. 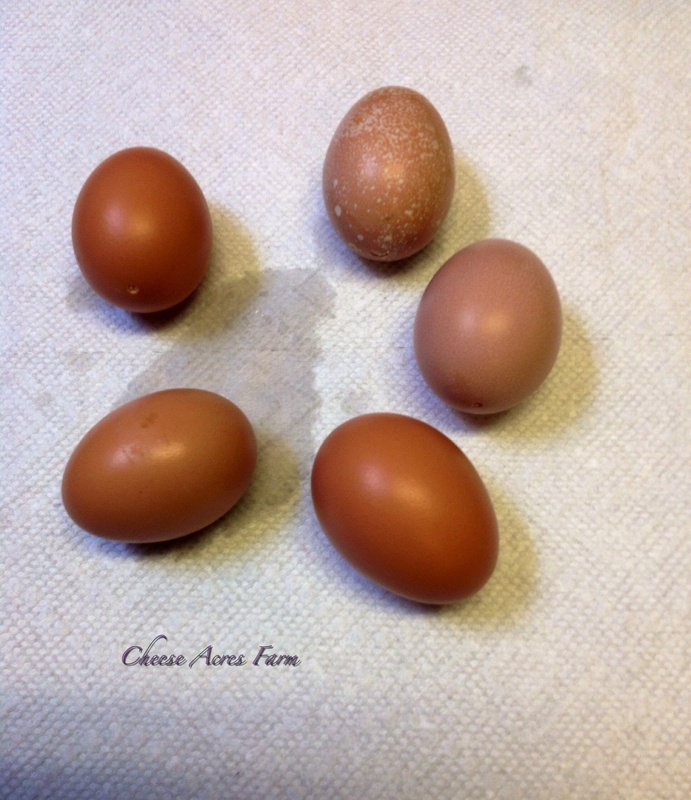 Our bantams lay a pee wee sized cream colored egg! It just depends on the breed. Our chickens are not given any artificial light to make them lay more or bigger eggs. We let nature do its thing. Factory farms, where the hens are kept in tiny cages and roosters are unwanted and killed at birth, force the hens to go through a molt and withhold food to increase egg size after the molt. They use artificial light year round to produce more eggs. The hens bodies never get to rest. This is another blog for another day and not how we operate. Hopefully I’ve answered some questions. Feel free to leave any other questions you might have in the comments and I will find an answer for you! May is National Egg Month! Do you know where your eggs really come from? Where do your eggs really come from? What do all those confusing terms and labels really mean? Hopefully we can clear up a bit of the confusion for everyone by answering some common questions. Is there any difference between white eggs and brown eggs? Nope. They taste exactly the same. In fact some hens lay blue, green, pink and other colored eggs! They all taste the same and have the same nutritional value, depending on where you get them of course. I buy “cage-free” eggs from the supermarket. Doesn’t that mean the hens get to roam outside? Not necessarily. It just simply means they have unlimited food and water and roam around freely in their habitat which is usually indoors. Most likely they are very crowded. Farm Fresh, that means I can be sure my eggs are fresh right? Only if you know your farmer and you get them straight from them! A factory farm is still called a farm. And that is the worst possible place to get your eggs. I’ve heard free-range are the best eggs to buy. Is this right? Well…. Just like cage free this really means they can move around in their habitat. They may have a door to the outside but they may also be so crowded they might not be able to find it. Their conditions are usually unsanitary and crowded most the time. Again, know your farmer. Unfortunately all three of these pictures you see here could be classified in your grocery store as “cage free”, “farm fresh” and even “free range” as long as there is a door leading outside. Disgusting isn’t it? Here are a couple more labels you may have seen. Omega-3 Enriched –This means their food is supplemented with foods higher in the Omega 3’s such as soy,flax-seed, and fish oil. Natural– Simply means minimal processing but has no regulations on the farms or food used. Organic– Organic has the USDA seal stating that the hens are fed organically and are free of hormones and antibiotics. They are usually free-range which we know means access to the outdoors. They might not be grazing in a field. Know your farmer. Pasteurized – Pasteurization is exposure to heat to kill off any possible bacterial. This might be good if you eat them raw but it destroys the nutritional value. Getting clean eggs from a farmer you know makes this not necessary. Pastured Eggs– At the moment this is the only label you can trust. Hopefully it will stay that way. Personally I don’t trust any egg from a supermarket. Pastured or grass-fed is what you are picturing when you see the hens out in the fields grazing away all day. At night they will head to their coops. This is true FREE-RANGING! They come and go as they please, have access to plenty of water, bugs, earthworms and other critters. They are living the high life. Their eggs have up to 20 times more healthy Omega 3’s than those poor factory farmed hens. So who needs Omega 3 added eggs? Pastured raised is how it was done “back in the day”. 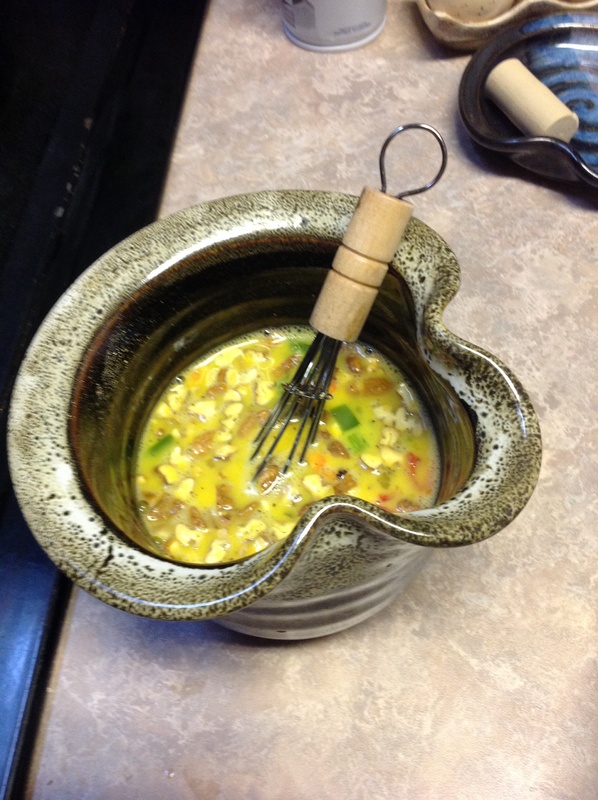 It is how we do it here at Cheese Acres. Our chickens have a huge fenced in area they stay in for protection against predators when no one is home. When we are here they are let loose for true free ranging of all the property. They go where they want to. The nutritional value of such eggs far exceeds others. I’m concluding today with this final advice. Don’t let grocery store labels fool you. 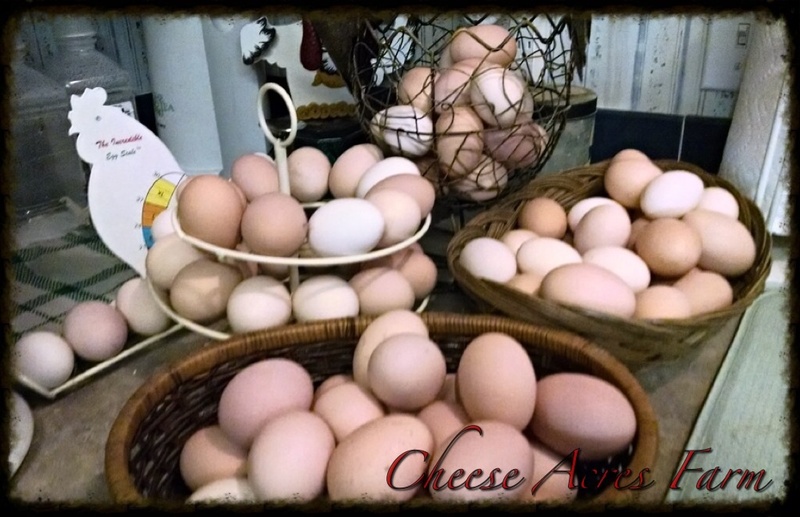 Buy truly fresh eggs from a local farmer. Know your farmer. Enjoying my free range freedom! A friend got some fresh eggs from us the other day and expressed concern over those slimy, stringy looking things in there. At first I had no clue but later realized exactly what she meant. 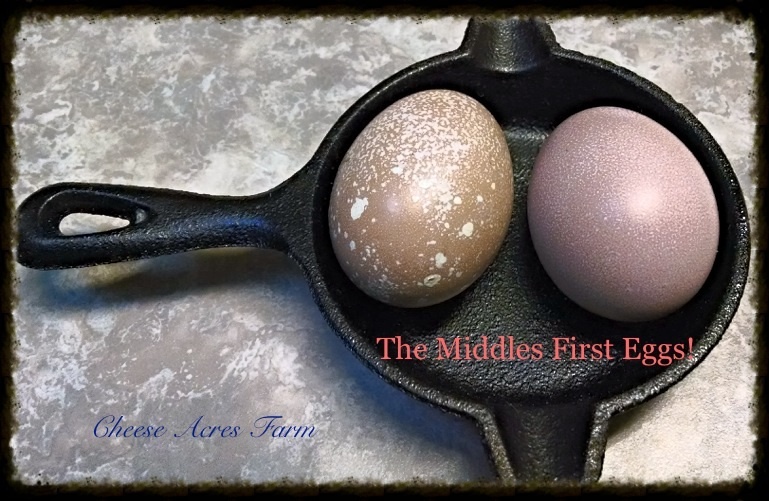 This made me stop to think that a lot of people may not realize just how different a fresh egg from the farm really is! This weeks blog will discuss that a bit. My eggs are not perfect ovals. Some are, but some look like bullets or torpedos. Some have little spots of different colors. They come in a variety of colors. Some have a weak spot on one end and some are so hard they don’t even crack when I drop them. Some have thin shells, some very thick, some have no shell at all (a rubber egg). Some are all wrinkled up. Some have no yolk, double yolks, and now and then a triple. I’ve even had an egg in an egg! They are all a little different and all normal. When when you crack them open the differences continue. 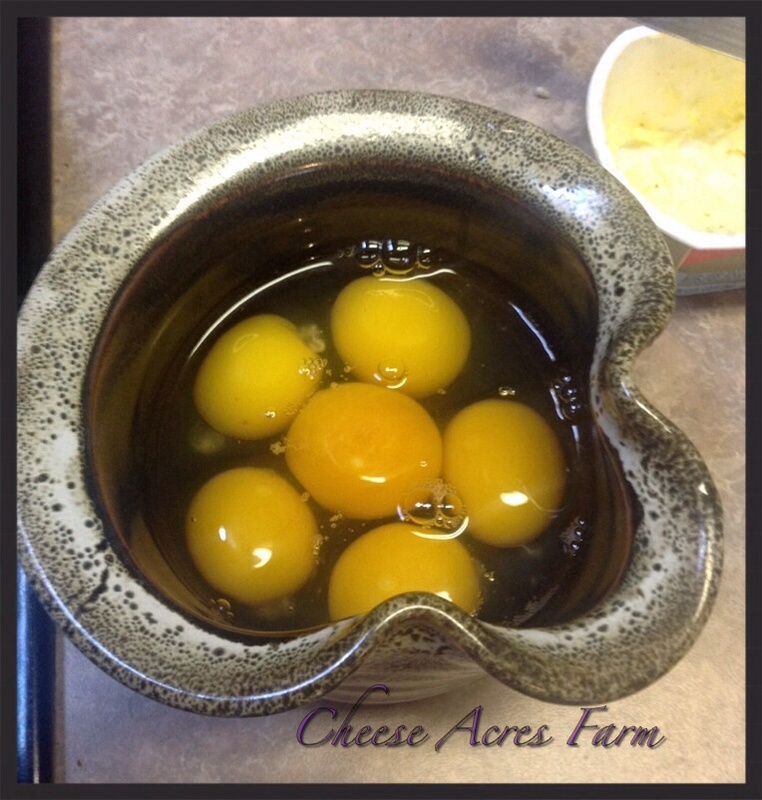 Here is a picture of a fresh farm egg cracked open compared with a grocery store egg. The first obvious difference is the yolk color and runny white (albumen). But after that you begin to notice other more subtle differences. Sometimes there is a meat spot (the result of a small piece of the oviduct sloughing off), a blood spot, (a busted blood vessel) both of which are perfectly normal and not harmful. They can easily removed if you think they are gross. (I remove them) There may also be the blastoderm, or bullseye, if you have a rooster(s). This just simply lets you know the egg is fertile. It does not affect the taste and is NOT a baby chicken. To become a baby it will need incubation under specific conditions and temperatures for 21 days. And then the squiggly, stringy little part my friend saw. It is the chalazae and is perfectly normal as well. You will see it very prominently in fresh eggs. Big Hint: This is why you won’t clearly see it in your store eggs. They are not fresh! 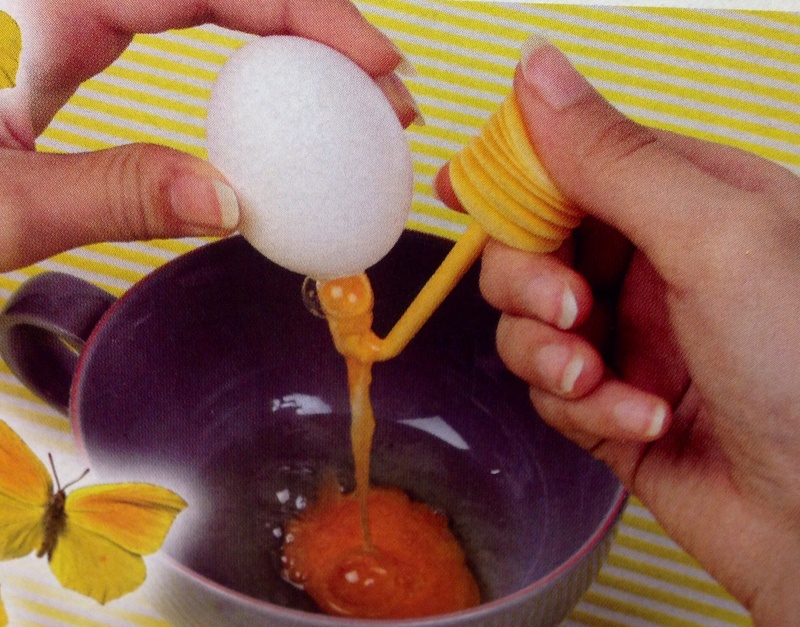 The Chalazae simple holds the yolk in place in the center of the egg. Fresh eggs make your cakes bake better and your breakfast taste yummier! Support your local farmers, buy fresh! My now 15 week old production red hen has laid an egg every day for 9 days! They are tiny and cute as can be. These are barely peewee sized,so they are bigger than the “wind” or “fart” eggs you might see sometimes. Although I’d love to crack one open and see exactly what’s in it I have so far refrained. I am going to clean them out and add them to my little basket of eggs. I am not one of those ultra crafty people who can paint and draw on eggs like you may have seen before so it’s a good thing I really love the natural colors. To get the insides out I’m taking a blas-fix egg blower, a handy tool that is available on Amazon, and puncturing a tiny hole in each end. 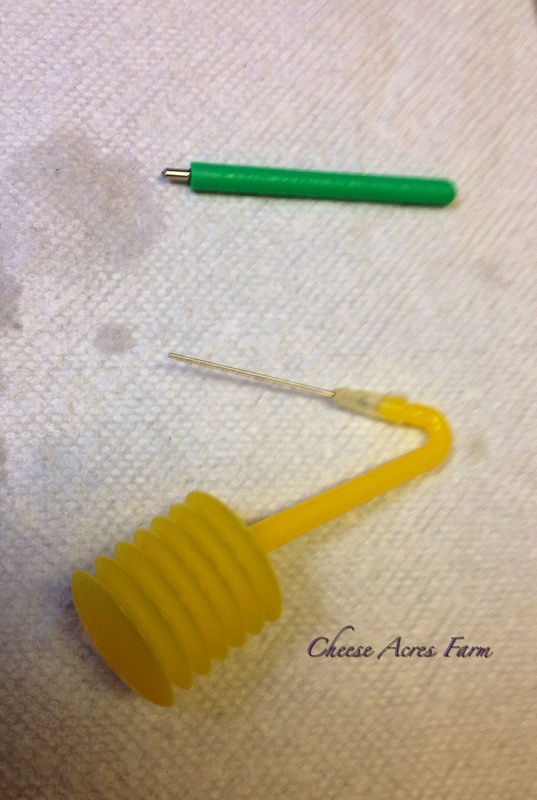 Once I have done that, I will insert the needle into the bigger hole and squeeze the pump. All the insides will squeeze right out. Once I have gotten all that will come out, I add a little water into the pump to clean the insides as thoroughly as possible. While I was doing the eggs, I accidentally cracked one and inside was a perfect little tiny yolk! Once I have several all cleaned out I will wash the outsides, put them on a paper towel in the microwave for about a minute or so on a low level. 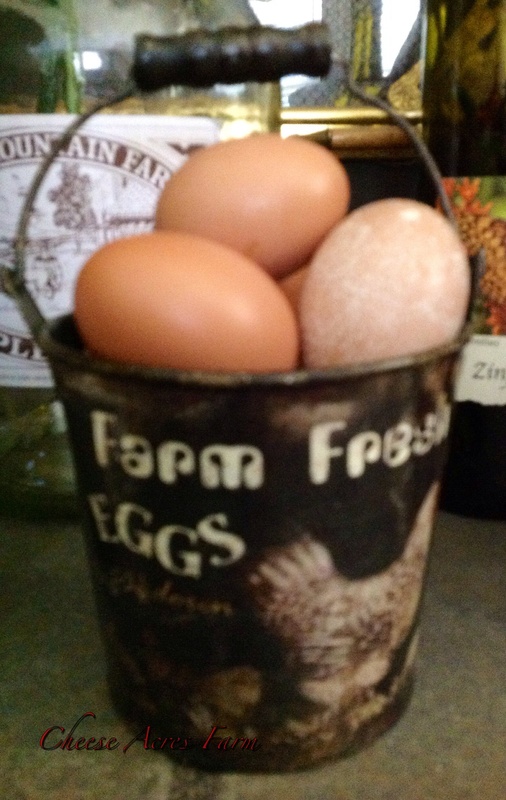 This will dry up whatever might have been left and take the fresh egg smell away so my dogs don’t try to eat them! When they are all dry they go in my egg basket for display. These are replacing the ones my dog ate before I learned the microwave tip! We live and learn don’t we? Quick update: On day 10 and 11, she laid a real medium sized egg. We have a real egg layer now. Whoo hoo! For those of you keeping up, our middles are 14 weeks old today. One of them laid an egg yesterday! Wow, talk about an unexpected surprise! We were preparing for it in a few weeks. I had to scramble and put a couple nesting boxes in the hoop house fast. I put a milk crate nesting box in where I found the egg and they tipped it over and played with the straw! So I fixed it back up and moved the box and of course found another egg in the exact same place this morning! Now the box is back as close to where she (they?) are laying as I can get it. We’ve got a lot of work to do this weekend to get permanent boxes up, and calcium and grit feeders made for them. We’ve got new layers! Let the excitement begin!